Thorough history taking is an important first step in treating the patient. Each physical therapist will develop their own style and technique, but a good interview will include the basic elements discussed below. Mechanism of the injury - How the injury occurred and what was the cause. Timeline-When is the pain at its worse and when is it relieved? Presence and location of numbness and tingling. Were any diagnostic test/imaging performed and what were the results? This section deals with screening the patient for possible serious pathologies that could cause wrist or hand pain. These conditions could warrant a referral, or consultation. Top five physical findings which are most useful in screening for wrist fracture. Hx: Hx of trauma, fall on outstretched hand (FOOSH). Older age, >65. The risk is same for men/women. Risk factors include hypertension, hypercholesterolemia, obesity, diabetes, and smoking. Commonly affects lower extremity over upper extremity. Can include wrist strain, sprain, joint dysfunction, repetitive injuries or h/o trauma without specific identified diagnosis. During the posture examination the physical therapist should examine from the lateral, posterior, and anterior views looking at the position of the cervical and thoracic spine along with the shoulder, elbow, forearm, wrist, and hand. Common muscles that are affected by radial nerve entrapment are primarily on the dorsal aspect of the hand. When examining a patient with a distal upper extremity condition it is advisable for the therapist to screening proximal structures to determine if they are involved in the patient’s clinical presentation. Below are some common ways physical therapists may screen these proximal structures. The goals of functional tests are to obtain and quantify an asterisk to assess/reassess after intervention is performed. Which impairments could be underlying their inability to perform the functional task? Some examples are turning a door knob, holding a key, initial pain free grip or key grip. To reproduce symptoms if a peripheral nerve entrapment diagnosis is suspected positive response is increase in pain or symptoms elicited different from the unaffected arm. 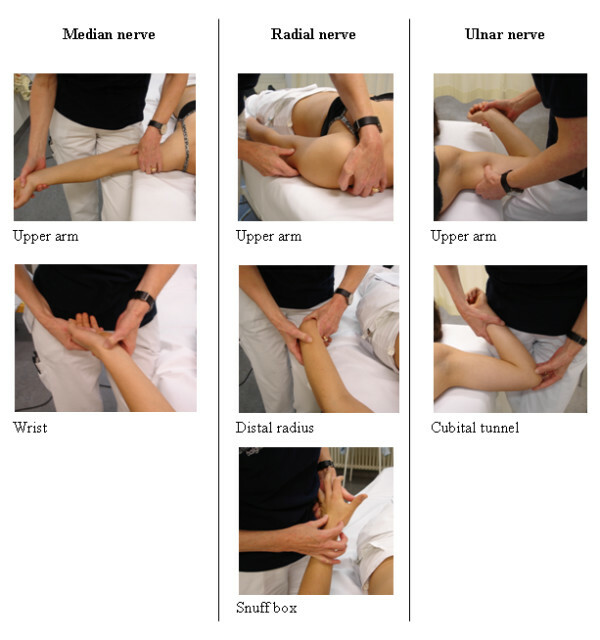 To palpate the 3 major nerves of the upper extremity refer to the figure below. Median: Position patient supine, 90 degrees of shoulder abduction and elbow extension. Palpate medially to the bicep (mid humeral). Palpate distally at wrist. If patient is pain free to end range, the physical therapist may choose to apply overpressure. The physical therapist may elect to perform various special tests during the physical examination of an individual with wrist or hand complaints. Below are potential tests that may be utilized categorized by possible diagnosis or tissue involvement. ↑ Cevik AA, Gunal I, Manisali M, et al. Evaluation of physical findings in acute wrist trauma in the emergency department. Ulus Travma Acil Cerrahi Derg. 2003;9(4):257-261. ↑ Wainner RS, Fritz JM, Irrgang JJ, Boninger ML, Delitto A, Allison S. Reliability and diagnostic accuracy of the clinical examination and patient self-report measures for cervical radiculopathy. Spine (Phila Pa 1976). 2003;28(1):52-62. ↑ Schmid AB, Brunner F, Luomajoki H, et al. Reliability of clinical tests to evaluate nerve function and mechanosensitivity of the upper limb peripheral nervous system. BMC Musculoskelet Disord. 2009;10:11. 1. Cevik AA, Gunal I, Manisali M, et al. Evaluation of physical findings in acute wrist trauma in the emergency department. Ulus Travma Acil Cerrahi Derg. 2003;9(4):257-261. 2. Wainner RS, Fritz JM, Irrgang JJ, Boninger ML, Delitto A, Allison S. Reliability and diagnostic accuracy of the clinical examination and patient self-report measures for cervical radiculopathy. Spine (Phila Pa 1976). 2003;28(1):52-62. 3. Schmid AB, Brunner F, Luomajoki H, et al. Reliability of clinical tests to evaluate nerve function and mechanosensitivity of the upper limb peripheral nervous system. BMC Musculoskelet Disord. 2009;10:11.